Time. I never seem to have enough of it in my day. Ironically this occurred to me when trying to find the time to write this blog. Time, or lack thereof, even extends to our vacations. According to a well-respected industry expert, Americans continue to take vacations, but take shorter trips and travel closer to home. And when we do take a break, we can find ourselves with a mindset of "hurry up and relax" - trying to cram every bit of what we want to experience into an extended weekend or business trip. Alamo Drafthouse: Dinner and a movie? Kill two birds with one stone and do both at this movie-lovers oasis. Named the best theater ever by Time Magazine, the Alamo offers mainstream and independent programming including international films, small-budget indies and more. A full-service menu includes aptly named noshes like The Godfather pizza or the Once Upon a Time in Mexico salad not to mention specialty beer, wine and cocktails. Time to spare? Be sure to arrive early to catch quirky trailers and clips fittingly aligned with your film of choice. 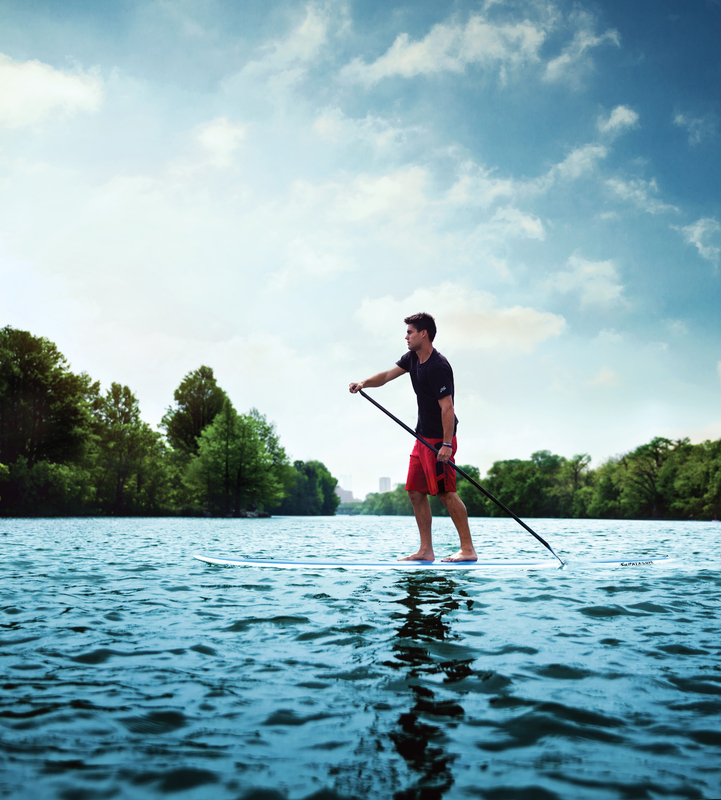 Stand up paddleboarding on Lady Bird Lake. Paddleboard Yoga: No time like the present to get in a workout or two! Get out of the studio and get the most out of Austin&apos;s great outdoors by combining stand-up paddleboarding with yoga on Austin&apos;s Lady Bird Lake. Beginner and advanced yogis welcome - no prior experience on a stand up paddle board required. A fantastic core workout that will leave you feeling like time, for once, is standing still. AO Tours (Austin Overtures): Explore the best of Austin in a mere 90 minutes with this information-packed narrated tour showcasing Austin&apos;s most iconic points of interest. Departs three times/daily from the Austin Visitor Center. Reservations recommended. Music in the Air: Didn&apos;t get a chance to experience Austin&apos;s renowned live music scene? Or maybe, just didn&apos;t get your fill? Take in one of 23 live music performances weekly on one of six stages at Austin-Bergstrom International Airport. Austin ain&apos;t called the Live Music Capital of the World for nothing. What is your favorite way to explore Austin? Let us know here or by sending us a tweet.